Went to the museum yesterday for an event, but was pleasantly surprised that the usual S$10/entry to the History Gallery was waived. I’ve visited the gallery many times before, and yesterday’s visit was nothing new. However, it reminded me that this permanent exhibition – beyond the hyperbole of the opening of the new museum a few years ago, which was mainly focused on its reinvented new public spaces – is indeed something different, not only on a local scale, but also the world stage. National museums across the world are essentially ‘nationalism’ projects, where governments – from the liberally democratic (like Sweden) to the painfully conservative (like Laos) – expand both time and money to set up exhibitions to ‘educate’ locals and tourists alike on their national histories. I’ve seen many a national museum in my day, and they all have one thing in common: An unrelenting one-sidedness in the way that each country narrates its history through the exhibits. These museums tend to only present ONE version of its history, so that this version becomes THE definitive version of its ‘exhibitable’ past. Even in liberal museums, this one-track history is at best an entertaining method through which the governments impart ‘facts’ as they have intended for visitors to absorb. At its worst, such national museums are nothing more than the propaganda mouthpieces for the very blurry lens of history as seen through those governments’ eyes (anyone who has been to the War Remnants Museum in Ho Chi Minh, Vietnam would know what I’m on about). 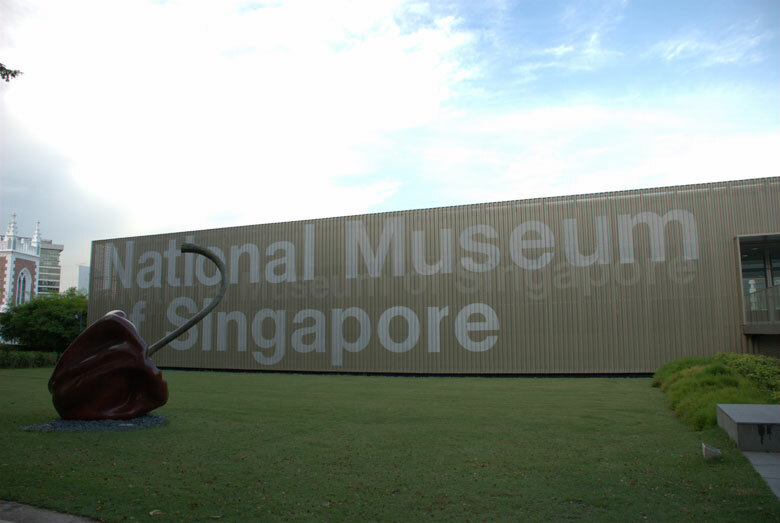 Perhaps the exhibition-method of the National Museum of Singapore is what such museums should strive for. According to this website (click ‘here‘), the museum allows visitors to choose between two tracks of ‘storylines’ (giving a choice to visitors is itself refreshing when compared to the single-track exhibitions of its compatriot museums); ‘Events’ or ‘Personal’. The ‘Events’ track (which is completely separate from the ‘Personal’ one) brings visitors on a ‘big-picture’ journey through the history of Singapore, as seen through major events and personalities. As expected, it’s founding by Raffles is there, so are WW2 and independence from the British. This track shows the conventional history of Singapore. While the ‘Events’ track showcases a ‘conventional’ version of Singapore’s history, the ‘Personal’ one brings visitors on a ‘micro-scale’ tour of Singapore’s history. On this track, we ‘hear’ the voices of people who would otherwise be ‘silent’ in a conventional museum; the poor, sidelined, downtrodden unimportant people whose ‘voicelessness’ never contributed to ‘major’ historical events but were nonetheless the cog-and-wheel in a nation’s rise. These were the trishaw riders, the Indian indentured labourers, the Japanese prostitutes, the China women who took a vow of celibacy so that they could work and send money home to family in China, the farmers, the gangsters etc. Let me illustrate with an example of how this ‘Personal’ track works so beautifully. Somewhere in the gallery is a large, life-sized reproduction of a photo showing some English(?) women sitting on a veranda having afternoon tea. Overhead is a strip of cloth sewn onto a wooden pole, which could be ‘moved’ by the visitor by pulling on a rope attached to a pulley. In effect, the visitor, in working the colonial ‘fan’, becomes the ‘servant’ who is attending to the ladies. On the audio-guide, the servant ‘overhears’ the ladies gossiping in polished Queen’s English about their ‘servants’. They talk about the need to be ‘firm’ with them, or they would not perform their duties properly. I like this display because it simplifies the very complex issue of ‘colonialism’ in early Singapore into an everyday situation that most visitors can identify with. These educated, well-born ladies, whom we would expect to be open-minded, liberal types, were also somehow caught up in the moment of colonialism and became ‘colonial masters’, albeit in a gentler, less-threatening manner. Such a display would help visitors understand that ‘colonialism’ in Singapore was not just perpetuated by British men with large bushy beards who were in service of the Queen/King (as written in many a school history textbook), but also by people who were far-removed from colonial government precisely because such an attitude was the pervasive one of the day that permeated all levels of colonial society in Singapore. Such ‘Personal’ voices run throughout half the exhibition, allowing visitors to see and hear a side of Singaporean history (from and of the common people) not usually featured in school textbooks. And for this, I think that the National Museum of Singapore is way ahead in its ‘multi-sited’ interpretation of history when compared to many, more-advanced, museums in the ‘West’.